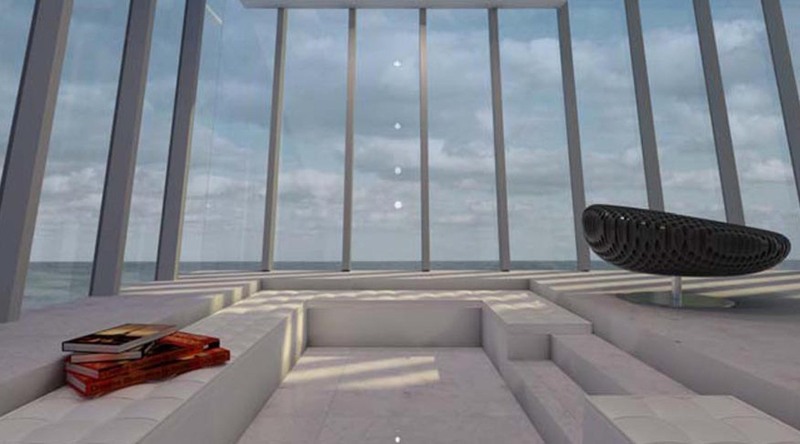 icture yourself waking up daily to a 180-degree view of the ocean without leaving the comfort of your living room. 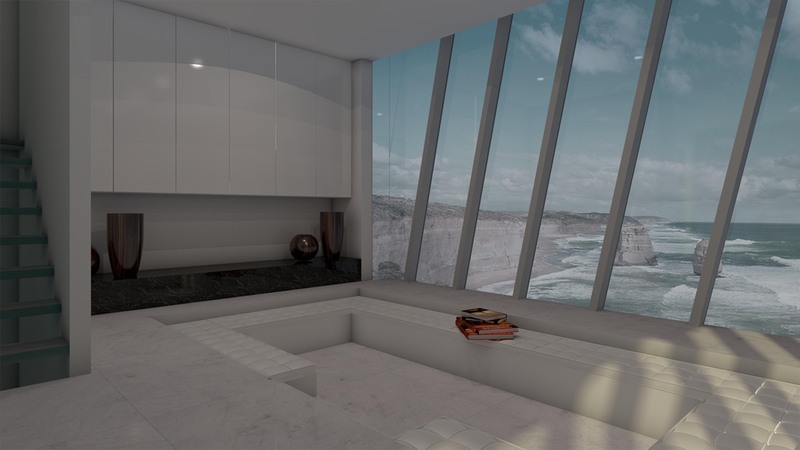 The owners of the as-yet-unbuilt Cliff House have teamed up with Modscape of Australia to design their compact dream home, delicately perched above open water, hanging off the cliff’s edge. Cliff House redefines “living dangerously” with its vast floor to ceiling windows and slender steel supports acting as the only separation between watching Jaws and actually being in Jaws. 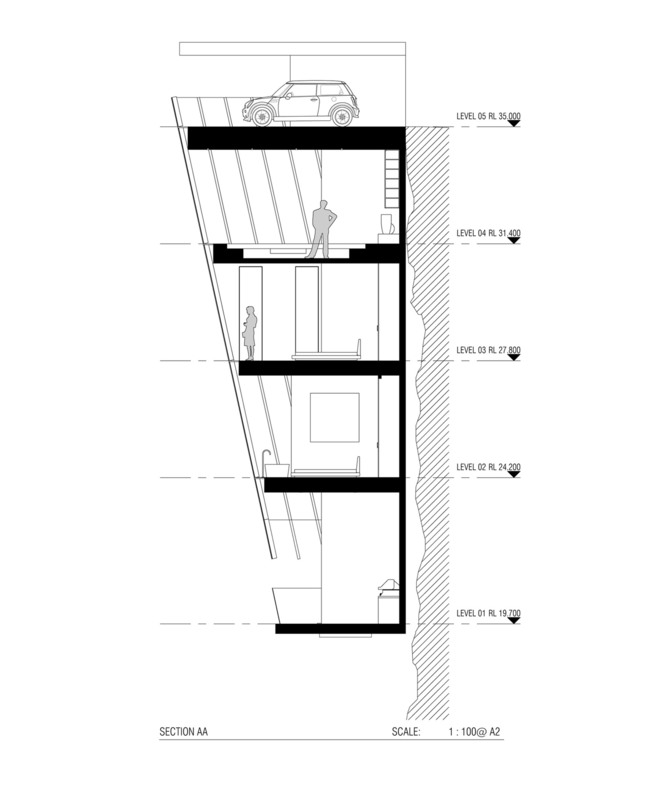 the car is parked atop the sleek home where the user can enter through a discreet staircase leading to the space below. Once inside, users discover the panoramic views offered in each of the glass-encased spaces. The spaces are stacked to grow more private from top to bottom, with the kitchen stacked above the living room, stacked above the bedrooms, with a private terrace beneath. The modestly proportioned home includes a full kitchen, dining room, three bedrooms, two bathrooms including an ensuite, and a spa on the open air terrace. Modscape takes its name from its signature modular design style, rooted in sustainability and speed. Modscape was challenged to rethink its typical modular design for Cliff House due to its remote location on the coast of Australia. The home will be constructed of several stacked modular units anchored into the face of the cliff using engineered steel pins. In response to extreme coastal conditions, the oceanside wall of the of the home tapers toward the cliffside creating an angled glass-curtain interior throughout the home. The home is designed to emulate barnacles as they cling to the hull of a ship, hence its position below the edge of the cliff. landscape, creating an absolute connection with the ocean.” All it needs now is 007 himself and an invisible Aston Martin in the garage.